LOS ANGELES (AP) — Conor McGregor will return to mixed martial arts on Oct. 6 in Las Vegas for a title bout against UFC lightweight champion Khabib Nurmagomedov. The UFC dramatically announced the matchup Friday with a promotional video to close a news conference promoting its slate of fight cards for the rest of 2018. “The fight is done,” UFC President Dana White said. McGregor (21-3) simultaneously held the featherweight and lightweight championship belts during his meteoric UFC career, but he hasn’t fought in MMA since taking the 155-pound lightweight belt from Eddie Alvarez in November 2016. 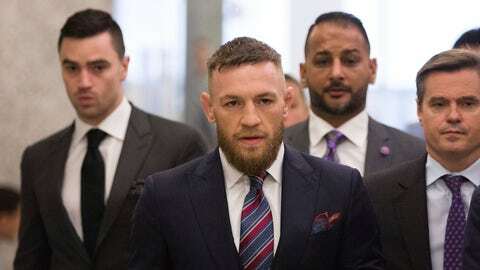 The loquacious Irishman hasn’t competed at all since losing his lucrative boxing match against Floyd Mayweather in August 2017, and his UFC lightweight title was stripped and subsequently claimed by Nurmagomedov in April. McGregor and Nurmagomedov will meet in the main event of the UFC 229 pay-per-view show at T-Mobile Arena, the same spot where Mayweather stopped McGregor in the 10th round of their one-sided prizefight. McGregor also has resolved his legal troubles after throwing a hand truck at a bus containing UFC fighters during a one-man rampage last April at Brooklyn’s Barclays Center. Nurmagomedov was the intended target of McGregor’s wrath after a previous spat between the fighters’ camps. Nurmagomedov (26-0), who wasn’t actually on the bus, won the vacant lightweight belt by beating Al Iaquinta in Brooklyn two days after McGregor’s attack, which injured uninvolved fighters Michael Chiesa and Ray Borg. McGregor was arrested, but was sentenced last month to perform five days of community service, avoiding jail time in a plea deal. Nurmagomedov, the Dagestan-born Russian champion, has been one of the pound-for-pound greats of MMA when healthy, racking up 10 consecutive victories since joining the UFC. McGregor and Nurmagomedov weren’t at the Orpheum Theatre in downtown Los Angeles along with the other headlining fighters of the autumn cards, but the announcement of their bout set off wild cheering among the fans. Nurmagomedov is a formidable challenger for McGregor in a return from a 23-month break in MMA competition, but McGregor has never backed down from a challenge. Once McGregor resolved to return to the octagon earlier this year, Nurmagomedov was the obvious choice to be his next opponent — but the biggest obstacle to this bout appeared to be money. Negotiations for this bout dragged on for many weeks while McGregor argued a highly lucrative deal, even demanding an ownership stake in the UFC in exchange for returning to the cage, and Nurmagomedov also asked for a hefty raise. White didn’t disclose terms of the deal that was reached. McGregor didn’t immediately react to the bout announcement on social media. Earlier in the news conference, the UFC also promoted the long-awaited return of Nate Diaz, who memorably split two bouts with McGregor in 2016. The popular Diaz (19-11) hasn’t fought since that majority-decision loss to McGregor in August 2016, but he agreed to fight Dustin Poirier in a lightweight bout in New York at UFC 230 on Nov. 3. “It’s time to go, so it’s time to go,” Diaz said. Although Diaz alluded to unspecified legal troubles that kept him out of action, the veteran brawler also had waited two years in hopes of getting a highly lucrative third fight with McGregor. Diaz didn’t seem happy about the surprise announcement of McGregor’s next bout. “I’m not fighting on that show,” Diaz tweeted moments after stepping off stage, adding an expletive directed toward the UFC.